Known as Chokeberries for good reason. When raw they are so astringent that only the birds will eat them! Also known as chokeberry or the aroniaberry, it is usually seen in gardens as ornamental deciduous shrubs. This berry is native to eastern North America and there are two species that can be easily distinguished based on their color (red and black). Chokeberries are commonly found in wet woods and swamps and the two species can cross-pollinate to produce a purple-colored berry as well. 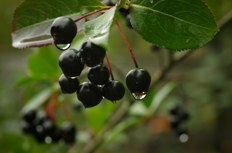 The common name, chokeberry, comes from the fact that the berries are highly astringent and inedible when raw. 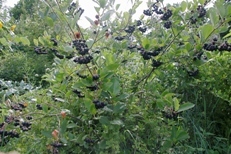 This a berry most commonly consumed by wild game, song birds, and other animals of the forest that have a high tolerance for bitter fruit. Most recently, however, there has been an increase in popularity for humans and the consumption of the berry because of the multiple health benefits it is thought to possess. Well, if it is healthy then we need to make room for it in our diet. 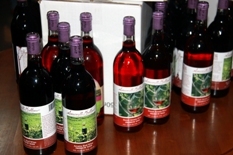 Chokeberries are being used as a soft drink flavoring and to make juices, wine, and jam. All things can be made better with a little culinary expertise and the larger sized berries are great for jam. As with all berries, the darker the variety the more antioxidants they contain. It has been discovered as of late that chokeberries possess one of the highest content levels of flavonoids and antioxidants than any other natural produce. 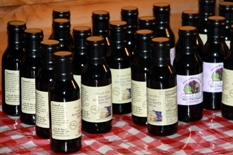 The visual proof of such high content levels can be seen in its coloration of deep purple and black pigmentation, arising from high concentration levels of phenolics, a class of phytochemicals, as well as anthocyanins. Total anthocyanin content and proanthocyanidin concentration in chokeberries are among the highest measured in plants to date. Chokeberries also contain a large amount of vitamin C.
The rich antioxidants in chokeberries allow this unique fruit to play a valuable role in its food group. The chokeberry has seen, through scientific methodological testing, significant proof of reducing risk to diseases caused by oxidative stress conditions. 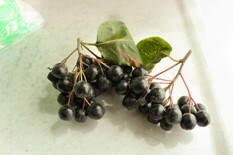 Some studies have produced preliminary results which show that the chokeberry may be beneficial for treating the following medical conditions: colorectal cancer (3), cardiovascular disease (1), chronic inflammation (2), gastric mucosal disorders (peptic ulcer) (6), eye inflammation (uveitis) (4) and liver failure (5). The University of Illinois hosts ongoing studies with the purpose of showing that they might include some components with the ability to fight cancer and cardiac disease. Some, but not all, of the benefits associated with chokeberries include: strengthening your heart, improved blood circulation, protection of blood vessels, relaxation of the smooth muscle in arteries, regulation of blood pressure, prevention of spasms in blood vessels, inhibition of blood clot development, inhibition of atherosclerosis progression, and protection of the coronary arteries from oxidant injury (1). Interestingly enough, aronia is more powerful than the average cranberry for urinary tract health, posing a potential preventative to colon cancer. Bell, D. R., & Gochenaur, K. (2006). Direct vasoactive and vasoprotective properties of anthocyanin-rich extracts. Journal of Applied Physiology, 100(4), 1164-1170. Han, G. L., Li, C. M., Mazza, G., & Yang, X. G. (2005). Effect of anthocyanin rich fruit extract on PGE2 produced by endothelial cells. Wei Sheng Yan Jiu, 34(5), 581-584. Lala, G., Malik, M., Zhao, C., He, J., Kwon, Y., Giusti, M. M., & Magnuson, B. A. (2006). Anthocyanin-rich extracts inhibit multiple biomarkers of colon cancer in rats. Nutrition and Cancer, 54(1), 84-93. Ohgami, K., Ilieva, I., Shiratori, K., Koyama, Y., Jin, X. H., Yoshida, K., et al. (2005). Anti- inflammatory effects of aronia extract on rat endotoxin-induced uveitis. Investigative Ophthalmology & Visual Science, 46(1), 275-281. Valcheva-Kuzmanova, S., Borisova, P., Galunska, B., Krasnaliev, I., & Belcheva, A. (2004). Hepatoprotective effect of the natural fruit juice from Aronia melanocarpa on carbon tetrachloride-induced acute liver damage in rats. Experimental Toxicologic Pathology, 56(3), 195-201. Valcheva-Kuzmanova, S., Marazova, K., Krasnaliev, I., Galunska, B., Borisova, P., & Belcheva, A. (2005). Effect of Aronia melanocarpa fruit juice on indomethacin-induced gastric mucosal damage and oxidative stress in rats. Experimental Toxicologic Pathology, 56(6), 385-392.